I would consider it a 5 Part: Face Bolt, Warrior Wheel, Element Wheel, Spin Track, and Performance Tip. Samurai Ifrit's is pretty interesting due to the Elevator Disk that slides up and down for the Spin Track...I'd never seen anything like it. 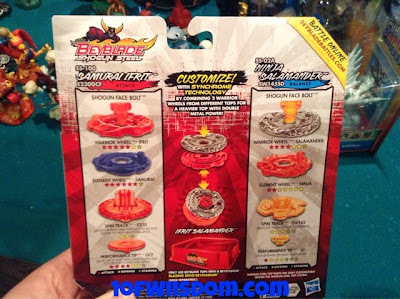 I think you can basically just ditch the Element Wheels on each and build with the Warrior Wheel's and selected bottom end (Spin Track and Performance Tip). Lots of options from what I can tell...the name of the pack came from the Ifrit and Salamander Warrior Wheels. Hope that helps...all new to me. Last I checked (maybe June), I was under the impression Zero G was coming, and it would be called Zero G...Apparently Shogun Steel is our Zero G, just localized to the US. The anime hasn't started here, but I was told mid-August, which is now, lol. 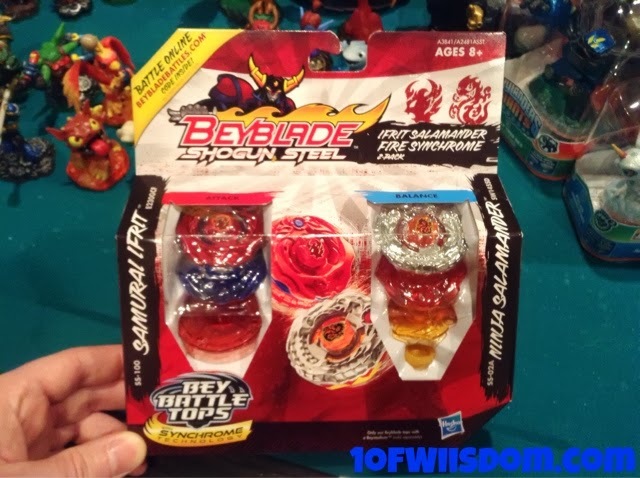 Is it just me or are the Greek gods always being left out in beyblade u get Pluto, Jade Jupiter, Vulcan Horusius, Proto Nemesis(this ones actually the same in Greek and Roman) it's the same thing with the planets you don't get Jade Zuess or Hephaistus Horusius. I'm just wondering why the Greeks are left out, the Romans actually stole the Greek gods and changed their names. Oh I just meant like how the developers picked the names, lol. That said, Earth Eagle is one of my personal favorites. My Nephew and I watched some Japanese episode of Zero G and he said that the other main guy in the episode was the one that had Earth Eagle. I looked at my other singles for Shogun and one has another E230 and the other is an A230.